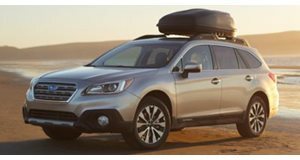 The Outback was Subaru's top-selling model in 2016 with 182,898 units moved, 30 percent of total sales in a record-setting year. That’s pretty impressive given how mundane and almost anonymous the Outback is. That’s not a shot at the jacked-up wagon. Subaru’s best-seller doesn’t offer neck-snapping performance. Drivers aren't lavished with luxury. It has an infinitely forgettable design. So how has the Outback become so damn popular? That’s what we aimed to find out during our week with the 2017 Subaru Outback. It didn’t take long to discover why buyers love the Outback. It’s a great all-around car and superb alternative to conventional crossovers and SUVs. What it lacks in looks and driving engagement the Outback more than makes up for in functionality. It’s even a bit luxurious on the inside. Those who remember when Paul Hogan was shooting ads for Subaru are likely shaking their heads in disbelief at that claim. We can’t speak for the cabin in the base model, but the Touring trim is well-appointed. Powering our tester was a 2.5-liter four-cylinder engine making 175 horsepower. The only transmission on offer is a CVT. All-wheel drive is standard (duh). The four-cylinder engine felt underpowered lugging around the 3,500-pound car. And that was with only one person inside. With five people and a trunk full of stuff…The good news is that Subaru also offers a 3.6-liter flat-six which puts out a spunky 256 horsepower. If you have a big family it may be smarter to opt for the larger engine. If you’re a lone wolf or coupled-up weekend warrior then it doesn’t really matter which power plant you pick. The only real difference is gas mileage. (That and the fact that owning a flat-six is kind of cool.) The four-banger is rated at 25/32/28. We averaged a combined 23.2 mpg. Now like almost every car in Subaru’s lineup that isn’t the WRX and STI, the Outback isn’t meant for on-road fun. It's no surprise that the on-road experience is less than engaging. Paddle shifters allow you to change fake gears but the only use for them is in passing situations. The fact that 0-60 mph takes 9.3 seconds tells you all there is to know. The fun to be had behind the wheel is when the road gets rough and muddy. There’s the aforementioned AWD, but the Outback’s greatest bit of off-road cred is its impressive 8.7 inches of ground clearance. There’s also X-Mode, a standard feature on the Outback which makes scaling and descending hilly terrain easier. Whether conquering hills or washed out dirt roads the superb suspension will absorb most of the bumps thrown your way. X-Mode and almost 9.0 inches of ground clearance are nice to have but aren’t big selling points. What buyers will appreciate is the great cargo space and the surprisingly high-quality cabin. The Outback has seating for five, and behind the rear seats there’s 35.5 cubic feet of cargo space. Fold the back seats down and that number balloons to 73.3 cubic feet. All that cargo space doesn't really eat into cabin space. There's a good amount of both leg and headroom in the rear. Both of these numbers are impressive and help the wagon stack up well against its crossover competition. But perhaps the biggest surprise with the 2017 Outback is just how nice its cabin is. The 2.5i Touring trim starts at $36,870 (including a destination charge of $875), the price our optionless tester stickered at. Normally test vehicles are loaded with optional goodies, so it was a nice surprise to learn that nothing in the Outback’s cabin cost extra. The model was never known for its cabin quality and comfort. But that’s all changed, at least on the higher-tier trims. Its leather seats are easy on the eyes and the body. The 7.0-inch touchscreen is user-friendly, if a bit uninspiring in both design and functions. There’s also dual-zone climate control, heated front and rear seats along with a heated steering wheel. For the safety-conscious Subaru’s excellent suite of driver assist technology, EyeSight, is standard on the Touring trim. What makes the Outback such a great seller is that it’s a smart buy even when cross shopped against SUVs and crossovers thanks to its standard AWD, loads of cargo space and competitively equipped cabin. It starts at $25,645 (the 2.5i trim) and runs all the way up to $38,145 (the 3.6R Touring). At almost all price points the Outback is a good choice, although we’d think twice before dropping close to $40,000 on one due to the less-than engaging driving experience and OK gas mileage.